The first line of the description field is what will become the Card title. This title will appear in CSV exports, calendar events, Slack notifications etc. The description is edited using a simple editor that is capable of bulleted lists, bold text and more. Tip: Describe the card so that your team members can understand it. Use the comment field for all other information. In development projects, writing the title as a user story is good way for keeping consistancy. E.g. "As a [user role], I want to [goal], so I can [reason]." Any additional information like comments, files etc should be kept in the comment section. 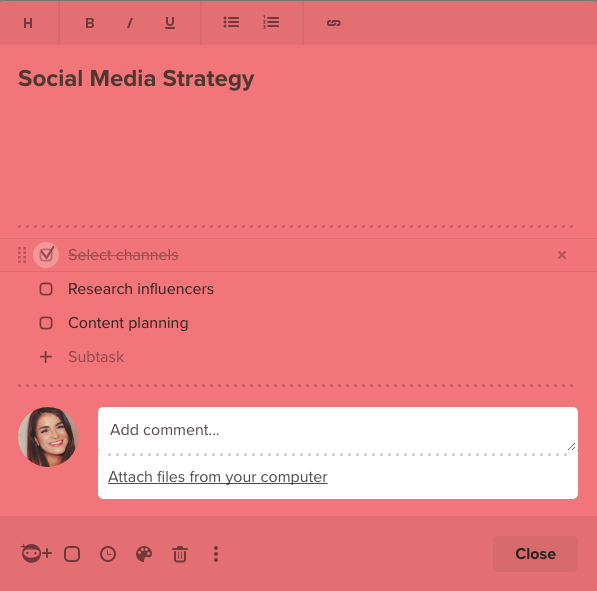 When commenting, your team members will receive notifications and they can easily reply. 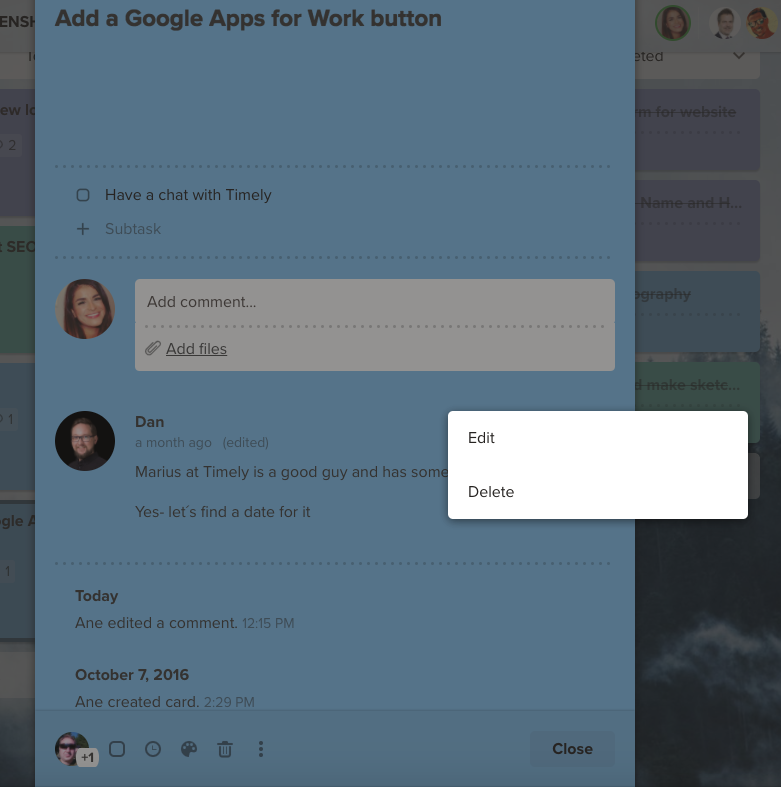 Subtasks enables you to break up work into smaller parts. This handy tasklist behaves very similar to a bulleted list where you can navigate (arrow-up/down), split (pressing enter-key inside a text), sort (drag&drop), insert (pressing enter-key at beginning or end of text) etc. A progress indicator will display the current overall status on a card. Completeing a card will not complete the subtasks within it (or the other way around). They will have to be completed separately. A Card can be assigned to one or multiple team members. When assigned, the Card will appear in the Card list for that user and the user will be reminded on due dates etc. Completing a card will mark it as completed. The card will take up less space on a Board and will be removed from any assigned users Card list. Setting a due date allows you to communicate expected delivery of a task. Only cards with a due date appears in the calendar and reminders will be sent when a task is expected to be delivered. Colors are a simple way of differentiating Cards in a visual, easy to spot, manner. This tool simply help you categorize and group your cards. There is no magic behind the colors, it's simply a visual aiding tool. Move Card to other boards. Archive card. 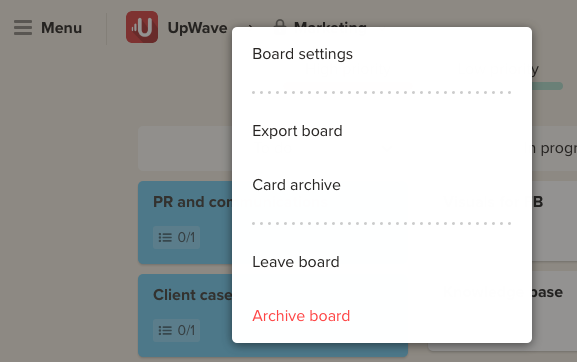 To find an archived card you will have to go to the drop down menu of your board and select card archive. Here you will also get the option to restore your card. The activity feed within a Card allows you to see if someone has edited a comment as well by whom and by date.